Pita is a round pocket bread widely consumed in many Mediterranean cuisines. The "pocket" in pita bread is created by steam, which puffs up the dough. 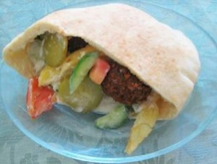 Pita is used to scoop sauces or dips such as hummus and to wrap gyros or falafel in the manner of sandwiches. Most pita are baked at high temperatures (450°F), causing the flattened rounds of dough to puff up dramatically. 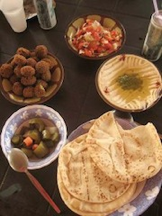 When removed from the oven, the layers of baked dough remain separated inside the deflated pita, which allows the bread to be opened into pockets, creating a space for use in various dishes. For short periods and daily use, store in refrigerator warm and serve. Lasts for month if frozen in sealed bag, and thaws quickly at room temperature. Cut Bread in Small wedges, Spread one with butter or your favorite spread. Sprinkle parmesan cheese. Sprinkle lightly with oregano or garlic. Heat 300 in preheated oven until crisp then serve hot. Cut in half. Stuff with your favorite filling. To make it crispy, heat it in the oven. Suggestions for hot Sandwiches, fill with meat or Falafel.